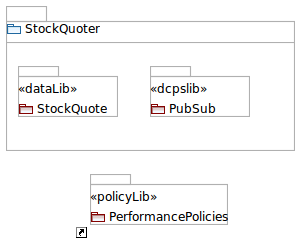 Create and populate various package diagrams that define the DCPS model, data definitions, and QoS policies. These steps are outlined below. This outline is not sufficient for using the SDK. The OpenDDS Modeling SDK installation includes additions to the Eclipse help system that provides details on working with an OpenDDS model. See Help > Help Contents > OpenDDS Modeling SDK Guide. The main diagram provides the structure that will hold all of the other diagrams that will be used in the model. Files associated with the main diagram are the XMI diagram file, <model>.opendds_diagram, and a XMI file of the semantic model, <model>.opendds. The file <model>.opendds is what is used to generate source code. This will open a package diagram. From this diagram all of the other diagrams that will be used in the model will be created. Package diagrams are the main entry point into capturing a model. They allow the developer to specify any package structures required for the project as well as defining any local or referenced DCPS models, data definitions, and QoS policies. Once terminal (non-package) elements have been captured on the diagram, sub-diagrams can be opened from them to edit the internal structure of those elements. Those diagrams are described below. 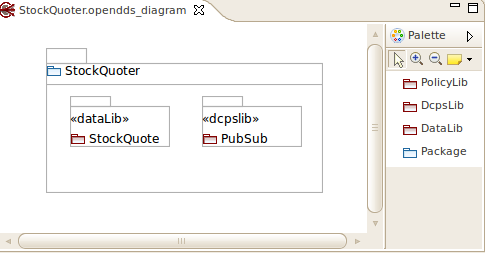 DCPS middleware diagrams capture the DDS Entities that will be used by the model. This includes Domain, DomainParticipant, Publisher, Subscriber, DataWriter, DataReader, Topic, ContentFilteredTopic, and MultiTopic Entities. These elements and their relationships define the DDS service that will be generated into a linkable library and made available to any linking application. Data definition diagrams capture the data types that will be transported between publications and subscriptions. 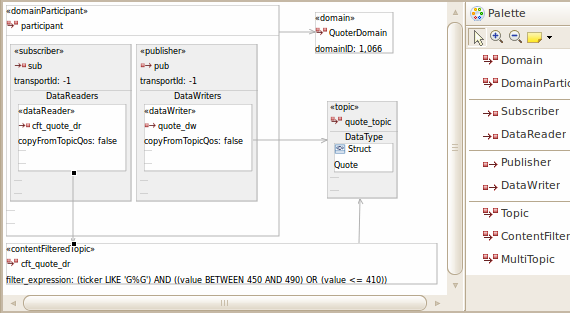 This is a simple graphical representation of the data structures that will be written and read from the DDS service. Only data types that have been defined in a model can be used by code generated from a model. These types may be included in a model or referenced from another model. 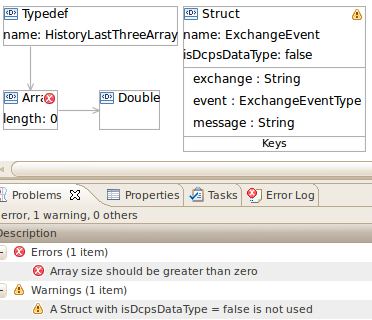 This allows data types to be defined in a separate, reusable, model that is then linked by many other DCPS models. 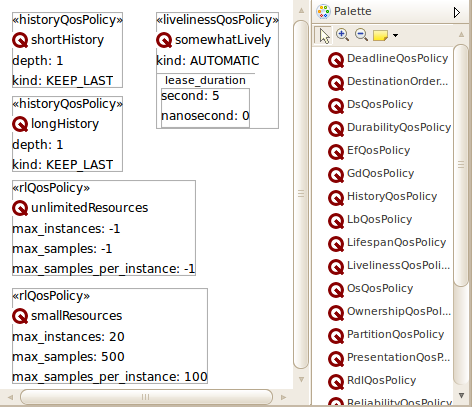 QoS Policy diagrams allow commonly used policy values to be captured and named. This allows a project to share the same policy values by name, ensuring consistency between all uses of those policy values. The OpenDDS Modeling SDK supports model libraries, which are packages of QoS policy, data types, or DCPS domain entities, whose elements can be used by other model libraries. A library in one model file can reference elements from a library in the same file or another file. Through the use of modeling libraries, reuse and concurrent development of different portions of a model is feasible. Libraries can optionally be placed in nested UML packages. Through the use of libraries and packages, a large complicated model becomes more manageable. Validations can be performed at the model level to find semantic problems that are not easily detectable in the code. For example, during validation of a DataLib a check is made that the size of Arrays is greater than 0. 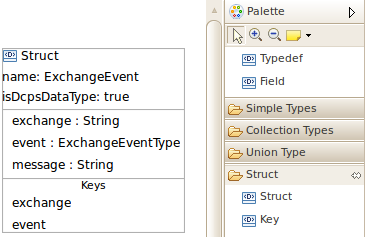 As another example, during validation of a DcpsLib, a check is made that a DataWriter is associated with a Topic. Resolving validations at the model level helps minimize the number of cycles of modeling > code generation > testing.